David Henry Hwang and Alain Boublil discuss the life cycle of their stage works based on the Puccini opera. Hui He as Cio-Cio-San and Roberto Aronica as Pinkerton in Puccini's Madama Butterfly at the Metropolitan Opera. Madama Butterfly is considered one of the "pillars of the repertory," says Peter Clark, the Met's Director of Archives. As such, it returns to the stage every two or three years, currently in the shape of a 2006 production originally directed by the late Anthony Minghella. "The works that tend to repeat are the warhorses that everybody knows and loves," Clark suggests. "Seasoned operagoers love the piece and want to hear it. Unseasoned operagoers want to hear it because they know it's famous. It has a strong public appeal." This same sentiment can be echoed about the two Broadway revivals that were inspired by Madama Butterfly, as well. Clive Owen and Jin Ha star in Julie Taymor's 2017 Broadway revival of M. Butterfly by David Henry Hwang. Puccini's opera was in Hwang's mind when he began to write the play M. Butterfly, the story of a French diplomat who falls in love with a Chinese opera singer he believes to be female, but is really a male spy in disguise. Hwang modeled his play on the strange-but-true story he heard at a cocktail party about Bernard Boursicot and Shi Pei Pu, who were caught in similar circumstances. "I thought about it for a year," he remembers, "and at some point, the question came into my head: what had the diplomat thought he'd found? He probably thought he found his version of Madame Butterfly." It's a testament to the opera's place, for better or for worse, in the public's collective consciousness that Hwang hadn't even seen Madama Butterfly when he came up with the idea for the play that would make him a household name. "I only knew the opera as a cultural stereotype of the submissive Asian woman," he says. It was only after buying a Madama Butterfly box set that his idea really took hold. Though there was no reference to Madama Butterfly in Hwang 's story of Boursicot and Pei Pu, the ill-fated romance between the opera's characters, American Naval Lieutenant B.F. Pinkerton and young geisha Cio-Cio-San (also known as Butterfly), offered the playwright the perfect allusion. "Once I had this idea to dovetail Madama Butterfly and the spy story," Hwang says, "I thought that at the beginning of the play, the Frenchman would fantasize that he was Pinkerton, and by the end of the play, he would realize that it was actually he who was butterfly and the Chinese spy is the real Pinkerton. That was the point where I decided, on some level, that I was doing a sort-of deconstructed Madama Butterfly." Hwang's assertion proved perfect. "When Boursicot saw the show, he said that he felt the psychology was basically accurate. It was a great thing to learn, because I made it all up." Alistair Brammer as Chris and Eva Noblezada as Kim in the 2017 Broadway revival of Miss Saigon. M. Butterfly premiered on Broadway in March 1988, where it ran until January 1990. Meanwhile, across the pond at London's Theatre Royal, Drury Lane, a very different version of Madama Butterfly had its premiere. Miss Saigon, by Claude-Michel Schönberg and Alain Boublil, is a loose musical adaptation, but one that hews closely to the opera. "Claude-Michel knows Madama Butterfly by heart," explained cowriter Boublil, "and I knew it enough to know that the story was completely unsatisfactory for the musical that we wanted to write. We had to find a way to attack it from a different time." It was when Schönberg came across a harrowing photo in a magazine that the pair realized they had their story. 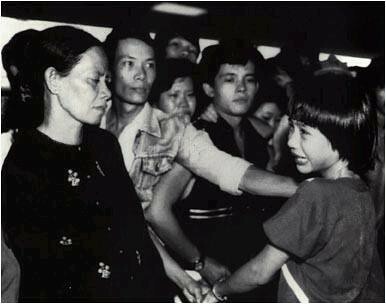 The image depicted a tearful mixed-race child at Ho Chi Minh Airport, about to board an airplane to the United States. The girl's Vietnamese mother was sending her away with the hopes that the child's American, ex-GI father would be able to provide her with a better life. "The idea was that Miss Saigon was going to happen during the last week of the Vietnam War, just before all of the American soldiers left the embassy," Boublil adds. To create their adaptation, the collaborators returned to the original sources of Madama Butterfly: Pierre Loti's 1887 novel Madame Chrysanthėme, John Luther Long's 1989 short story Madame Butterfly, and David Belasco's 1900 one-act play Madame Butterfly': A Tragedy of Japan, a work that Puccini saw on a trip to New York City. They also read books about the Vietnam War including Michel Tauriac's novel Jade, which, according to Boublil, follows a "French journalist and a Vietnamese woman, and how, after having a passionate love affair, they were separated just before his plane left from Saigon." This scene memorably plays out in their musical when a life-size helicopter lands on stage. In Boublil and Schönberg's retelling, the opera's Pinkerton and Cio-Cio-San become American GI Chris and Vietnamese bargirl Kim. It's an ancillary role from the opera that takes center stage in "Miss Saigon": Puccini's character Goro, a marriage broker, becomes the musical's principal character, the conniving Eurasian pimp called the Engineer. The fall of Saigon, as depicted in the 2017 Broadway revival of Miss Saigon. Miss Saigon premiered on Broadway in April 1991, just 13 months after M. Butterfly closed. "It was a little ironic that I was doing a show that was sort of a critique of Madama Butterfly, and then relatively soon thereafter, a non-ironic modernization of Madama Butterfly ended up coming to Broadway," points out Hwang, who famously led protests about Miss Saigon's casting of Welsh actor Jonathan Pryce as the Engineer. That all three works are running simultaneously, and within a mile of each other, is purely "serendipitous," as Clark suggests. On November 6, Madama Butterfly played its 870th performance since its February 1907 premiere at the Metropolitan Opera, and this enduring classic has become a blueprint for stories about love and relationships that are both personal and political in nature. "The Puccini opera has become this iconic template for an East-West story," Hwang suggests. The central "misunderstanding between two people and two cultures" is what fascinated Boublil and Schönberg. From the historical perspective, Clark agrees. "It's a very basic story about love, heartbreak, and betrayal that people can easily relate to," making the opportunity to catch these three very different productions the rarest of butterflies. A scene from M. Butterfly at the Cort Theatre.